I have now reached the final stage of my journey on the Thames, a return to central London. 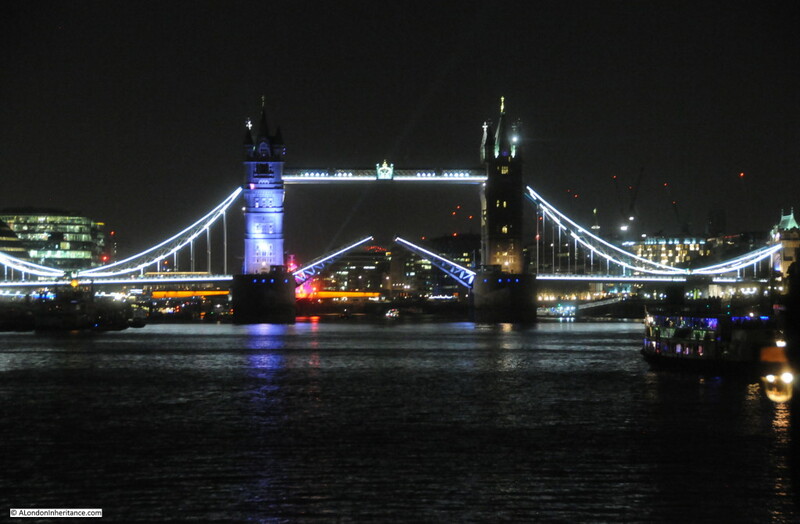 As darkness falls, the Thames takes on a new personae. It is very difficult to make out the twists and turns of the river, the water now appears very dark and merges with the night sky. 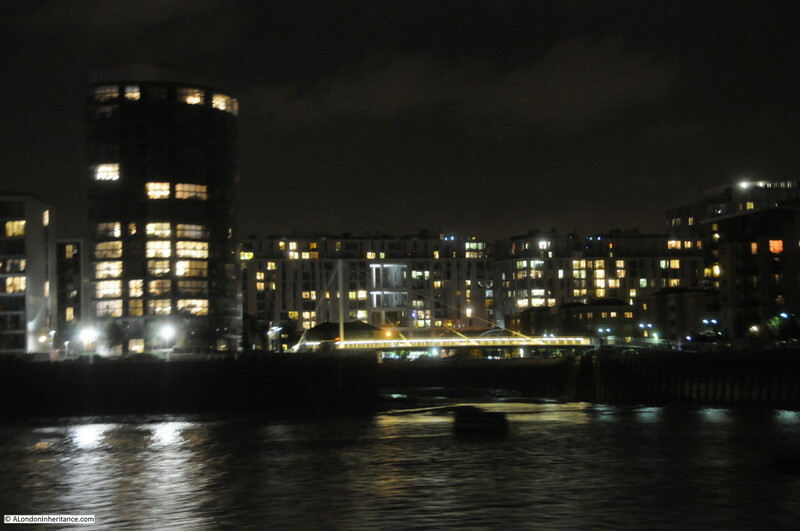 The bank of the river before reaching central London has pools of highly lit factories and buildings with long gaps of darkness in between. The river is also very silent. 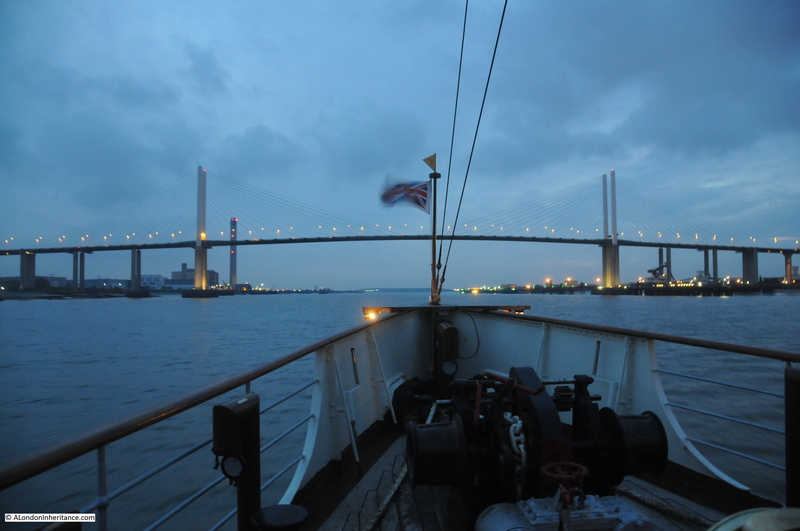 Darkness started to fall on leaving Gravesend, and before we look at the river, a quick video of the Waverley. The Paddle Steamer Waverley is a perfectly restored example of the type of passenger boat that would have been seen on the Thames. The industrial heritage of the Waverley is very important and it is the last sea going example of this type of craft. It is beautifully maintained and derives a substantial amount of the funding needed for maintenance through these trips. The engine room is the heart of the Waverley, generating the power to drive the paddles through the water.The following video starts with the engine room at rest whilst the Waverley is moored at Gravesend, then watch as the bells signal departure and the engines power up to start the Waverley’s journey back to Tower Pier. Now for the run into London. 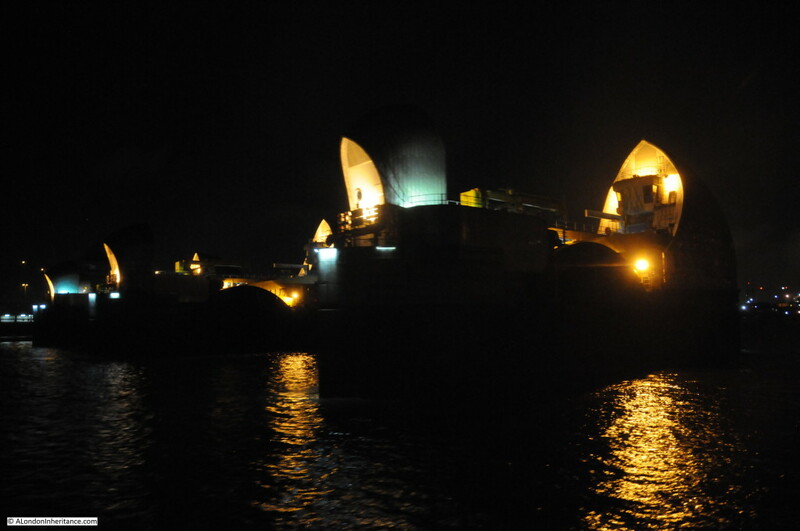 Taking photos after dark using a handheld camera on a moving boat is rather a challenge. Much of the river was too dark, however the following provide a view of the river using a sample of the photos that worked. 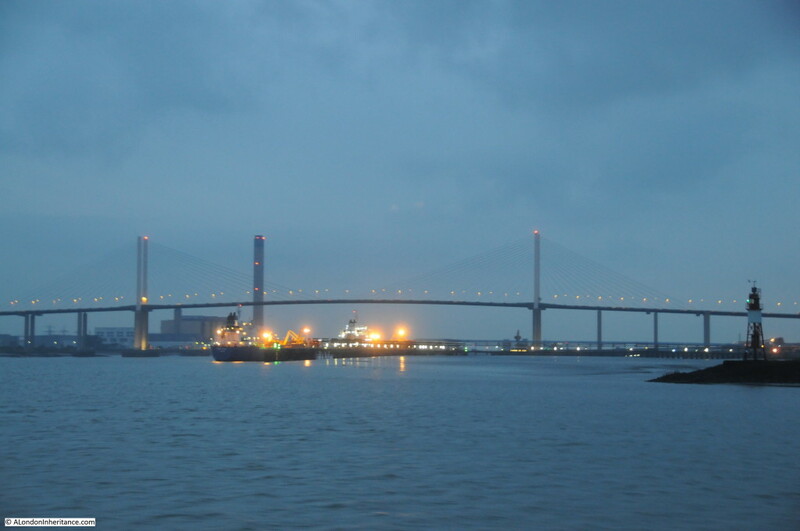 Dusk starts to fall as the Waverley departs Gravesend. We can now see how the river turns and some of the hazards. 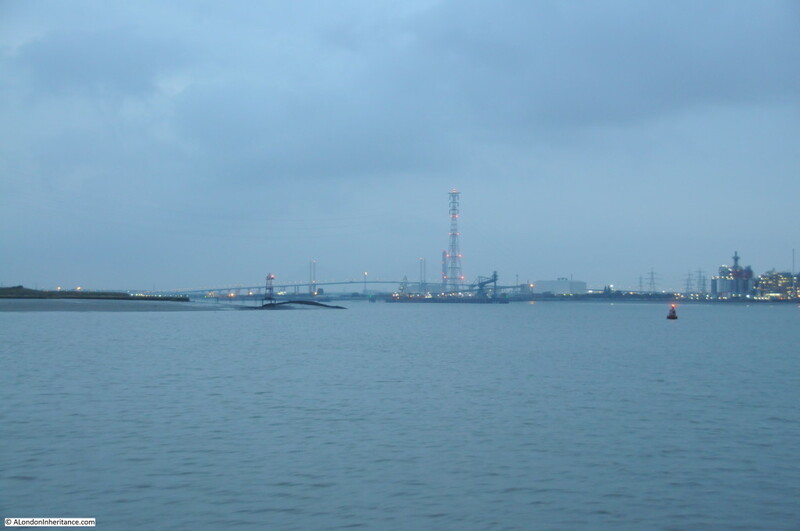 The Queen Elizabeth Bridge is in the distance, in the centre of the photo, however the river turns to the left to approach the bridge. On the land jutting out from the left is the Broadness lighthouse as when darkness falls, and without this lighthouse there are no other lights on this spit of land and without the lighthouse a boat could try and aim direct for the bridge. A close up of the Broadness lighthouse. 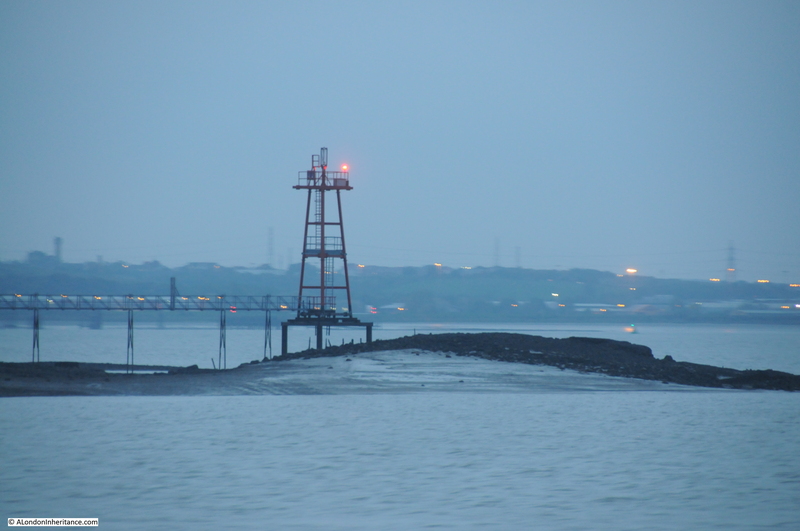 At high tide the land is submerged leaving only the lighthouse and the access walkway hovering above the water. A real hazard if it were not for the warning light. 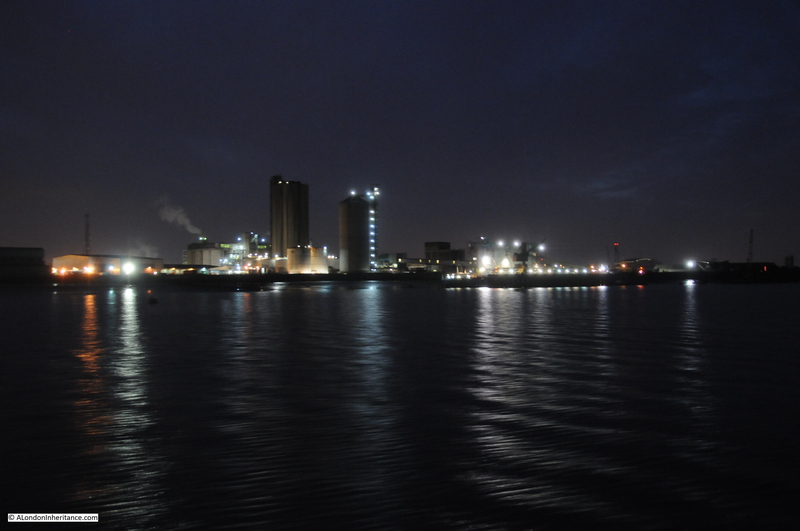 The industrial sites down the river look very different at night. Getting closer to the Queen Elizabeth II bridge with the Stoneness Lighthouse on the right. Having navigated the bends in the river, now heading straight to the bridge. 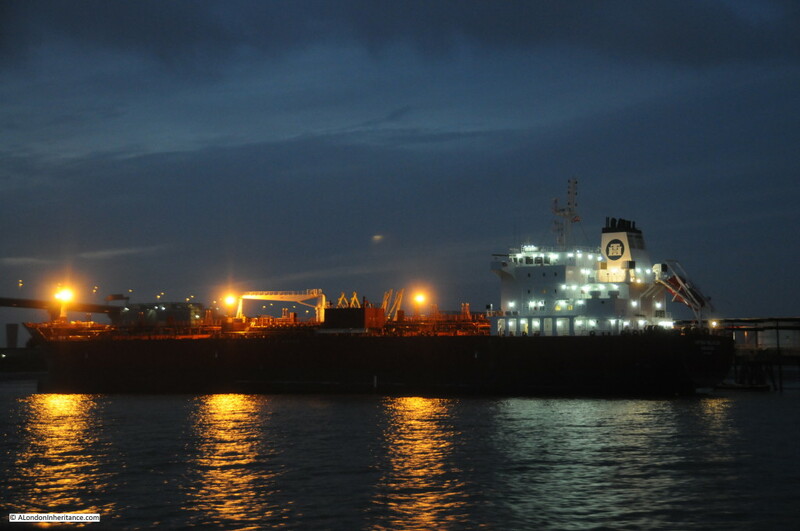 Ships along the river provide pools of light on the dark water. Passing under the bridge. 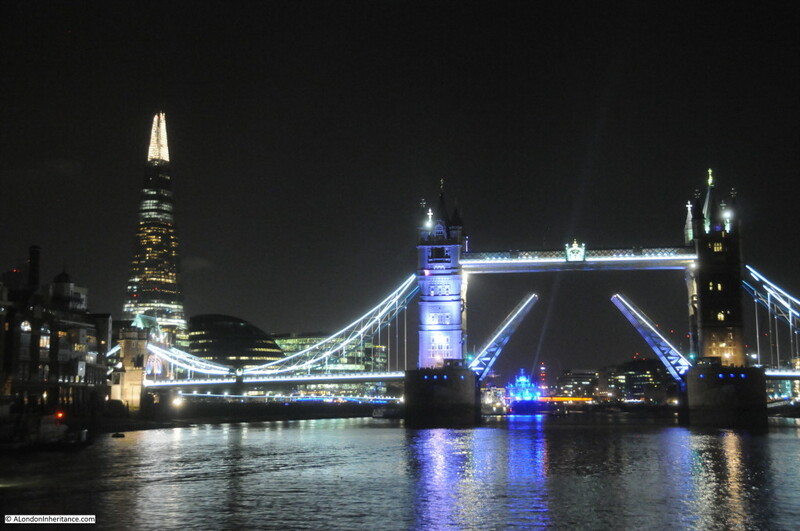 The two conical structures on the river bank to the right of the bridge are air vents of the two tunnels that also carry traffic under the Thames at this point. 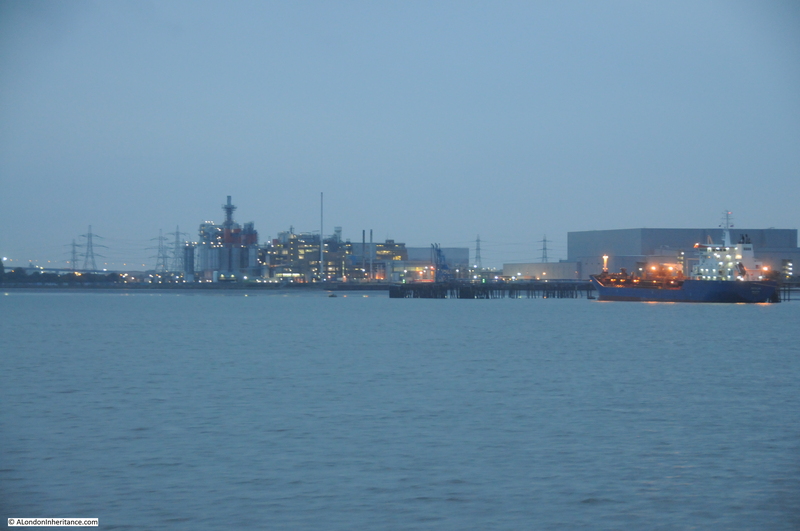 The Archer, Daniels, Midland Erith Ltd oil processing plant looks very different on the way back than on the way out. Now approaching the Thames Barrier. Each of the piers is lit up, I suspect not because they look good, but to ensure that each of the piers is very visible to shipping. About to pass through the barrier. Green direction arrows clearly point to the channel that should be used to navigate through the barrier. Through the barrier and the banks of the river now start to light up with the clouds reflecting the lighting from below. 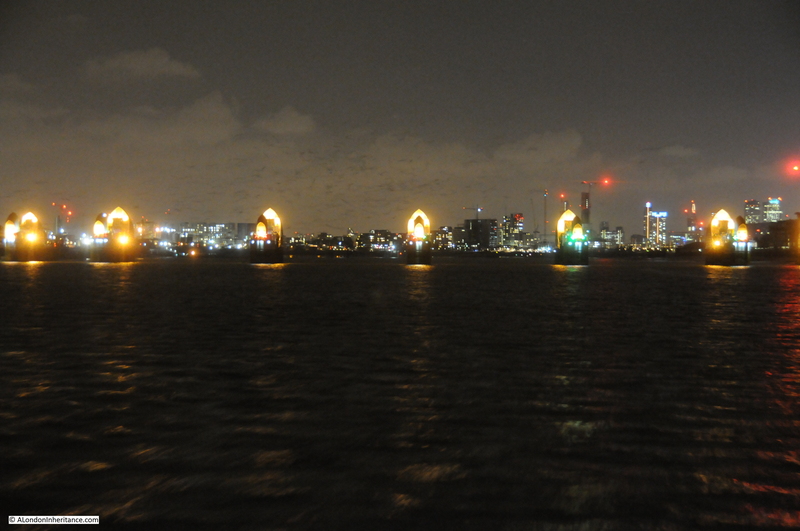 Here, Canary Wharf and the O2 Arena are on the left and the Emirates Air Line crosses the river directly in front. Each pod being lit with a red light. 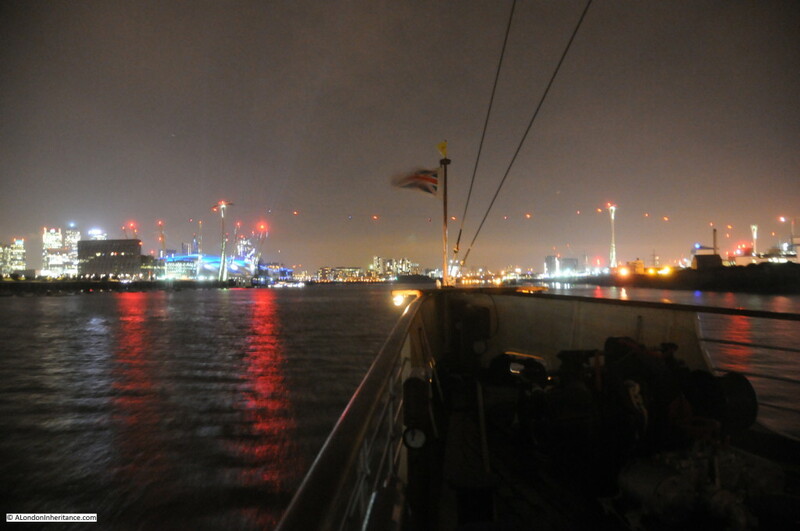 It was fascinating to watch the red lights cross the river on the approach. 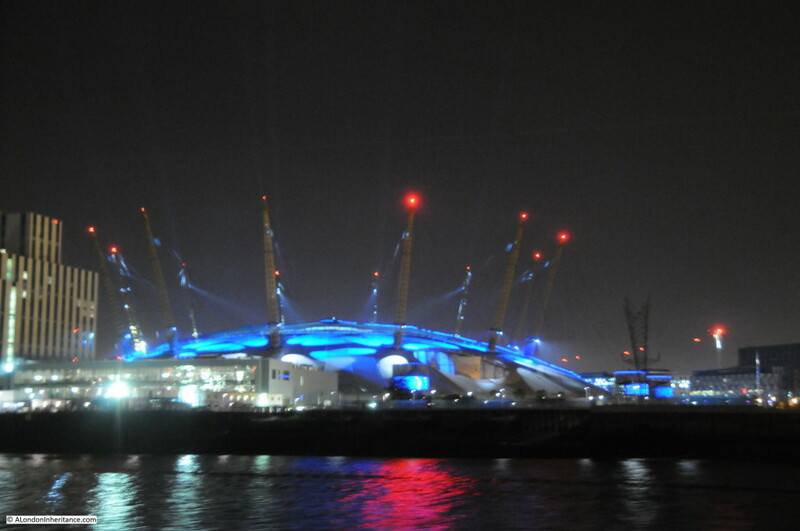 Up close to one of the towers supporting the Air Line with the O2 Arena in the background. With Canary Wharf in the background. 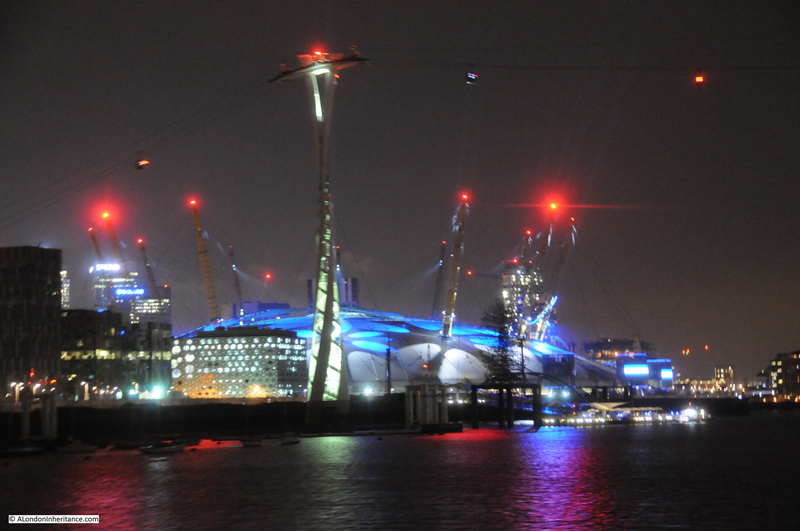 Passing along the Greenwich Peninsula, the Meridian Laser comes into view. The laser is located below the Airy Transit Circle in the Royal Observatory to ensure it is directly on the meridian line. 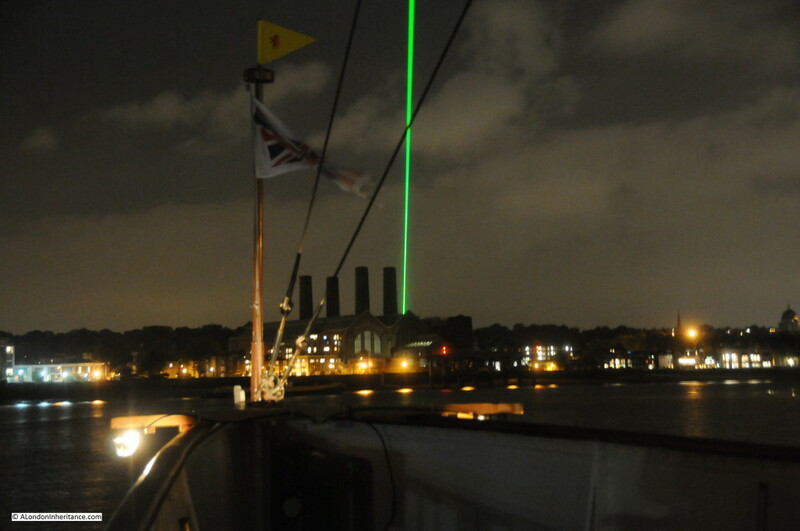 Under ideal conditions and being in the right position, the laser should be visible more than 60 miles from Greenwich. 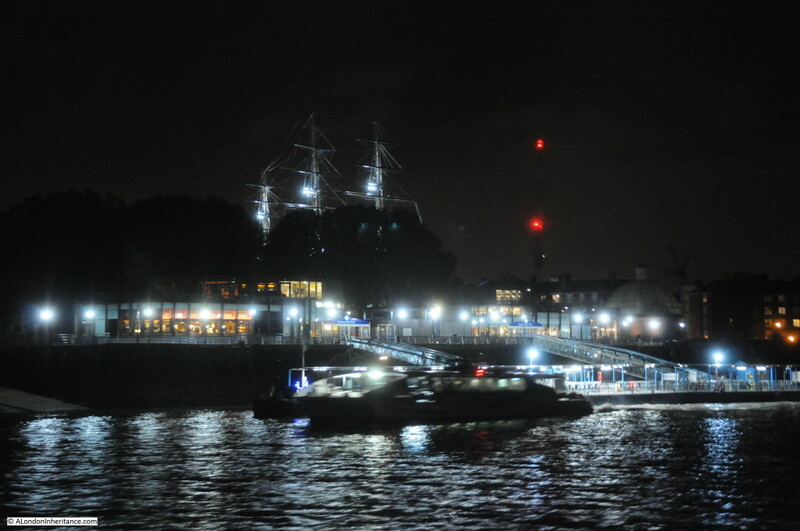 Passing Greenwich and the masts of the Cutty Sark along with the lights of the Greenwich Pier come into view. 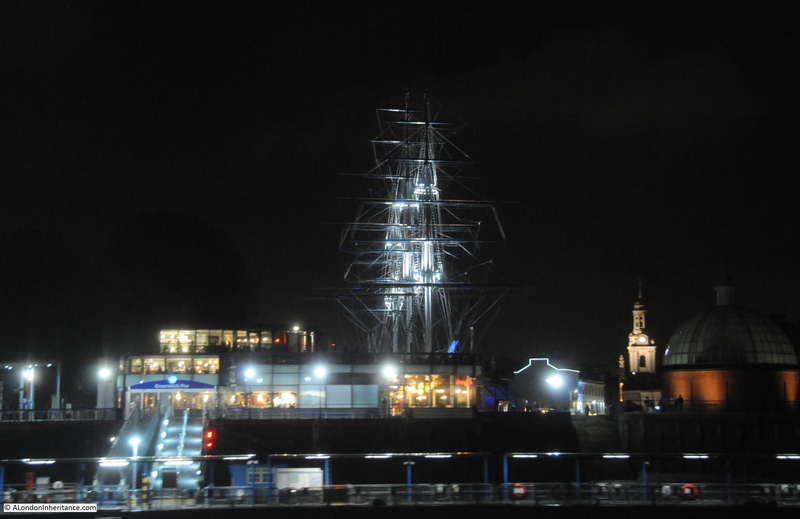 The lighting provides a rather ghostly appearance to the Cutty Sark. Passing Greenwich and here is the entrance to Deptford Creek. The new bridge standards out more than during the day thanks to the lighting running across the bridge. This is the new bridge that pivots on the left bank so that it can rotate into the Thames allowing ships to enter and exit the creek. 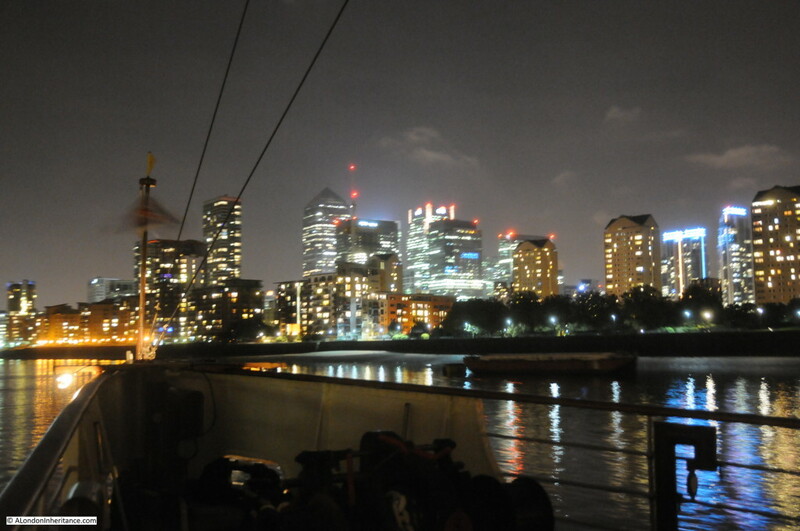 Passing along the Isle of Dogs. 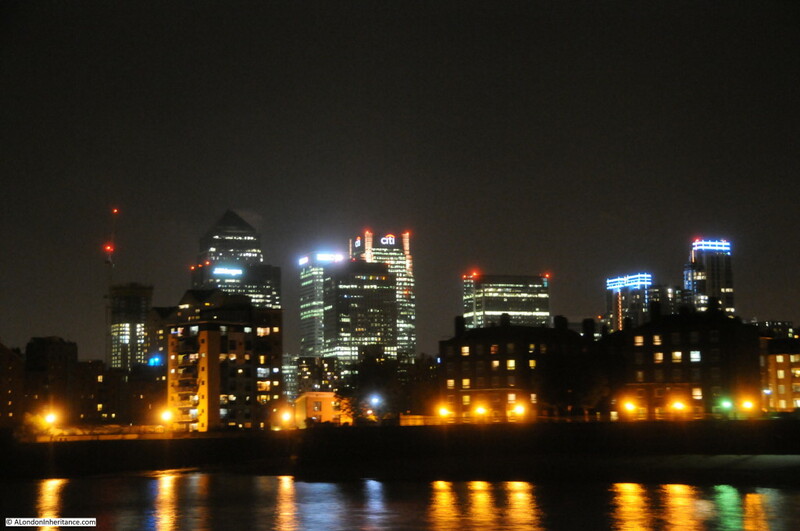 The brilliant lighting of Canary Wharf with the less intense lights of the homes along the river bank. Continuing pass the Isle of Dogs. The river is very quiet at night with very little activity. 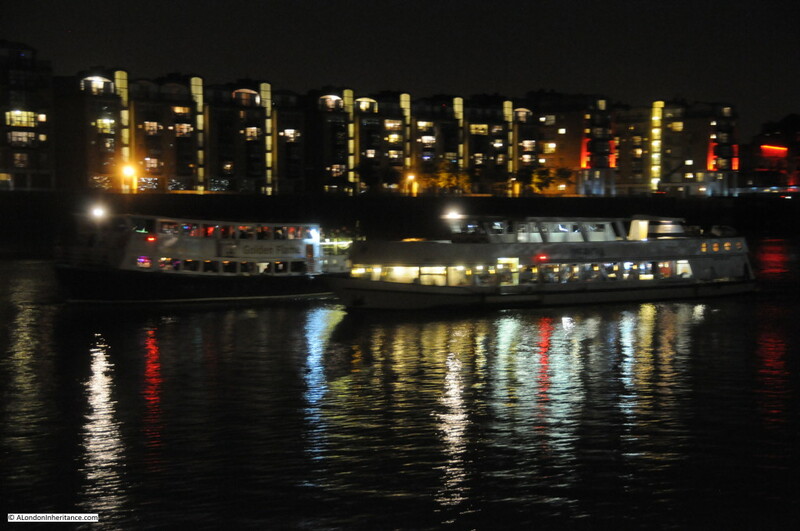 One exception are the party boats that come out at night providing a passing pool of light and noise before the river returns to silence. 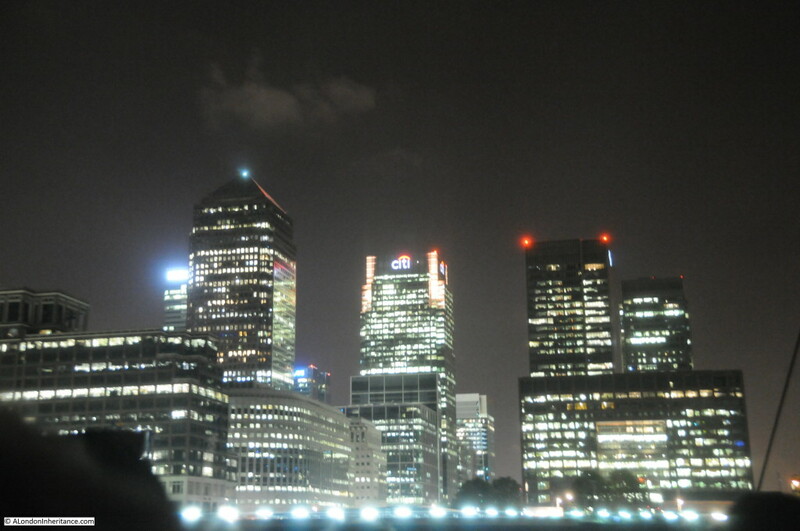 The brilliant lighting of Canary Wharf. 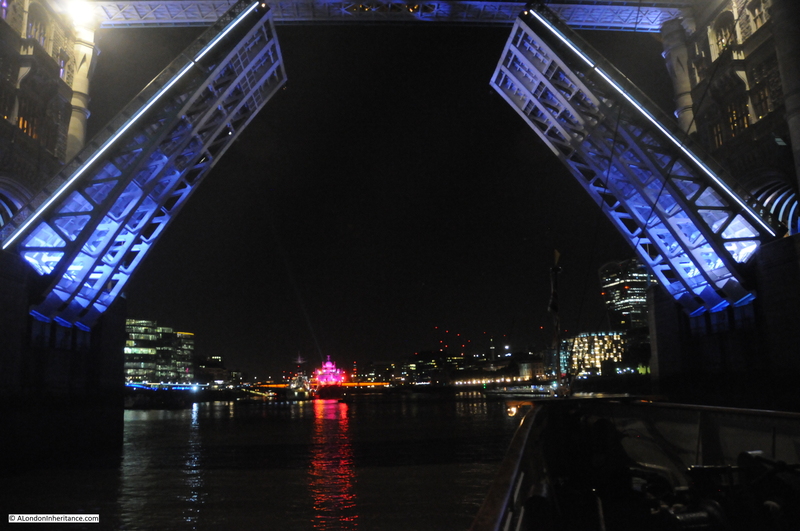 On the final stretch of the river into the city, Tower Bridge appears. On the right are the outlines of the historic vessels moored at the Heritage Community Moorings. Now heading towards Tower Bridge. Looks as if they have not replaced the bulb on the right hand tower. Getting close as the bridge starts to rise. Also, the red warning lights from the top of the many cranes across the city. Nearly fully open with the Walkie Talkie peering in from the right. And the Shard on the left. About to pass under Tower Bridge. 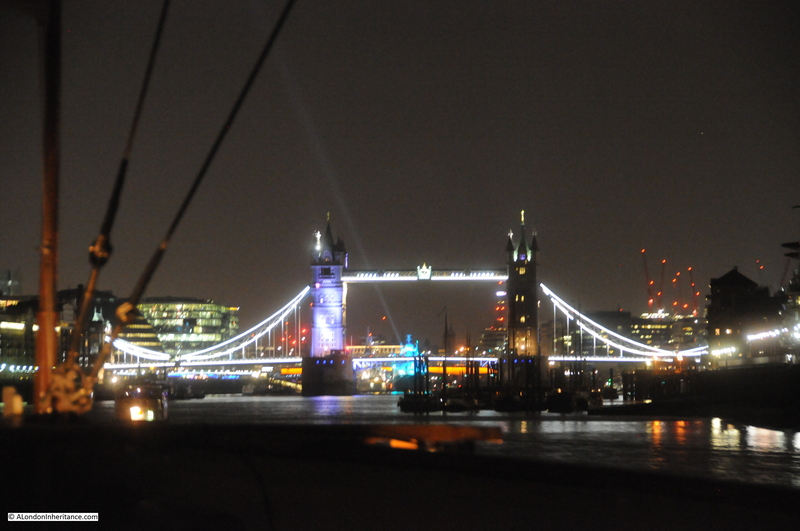 Through Tower Bridge and about to berth on Tower Pier. 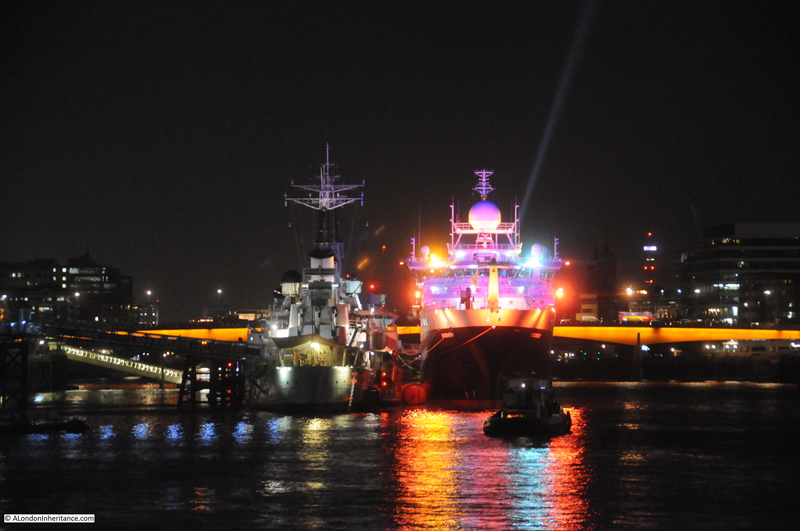 HMS Belfast is on the left along with the visiting research ship, the RRS Discovery moored along side. The River Thames is a fascinating river. 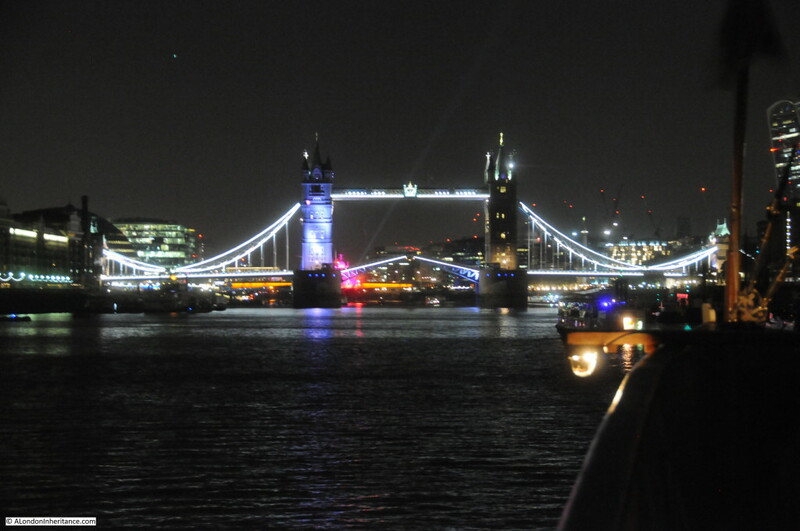 It is London’s river and it is remarkable to consider the number of people who have made the same journey over the centuries, and where they were leaving to, or arriving from. As with London, change is a constant along the river. What can be expected in the future? Certainly the endless march of apartment buildings along the river bank. 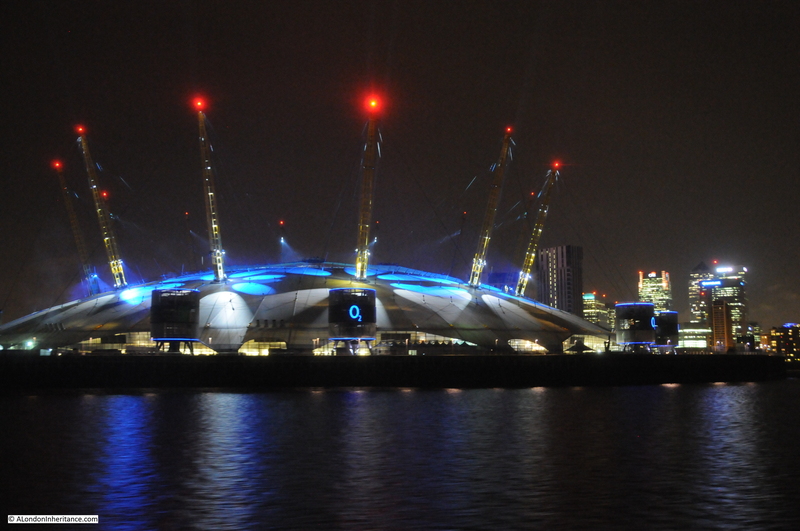 Within the next few years these will probably have run from Greenwich to the O2 Arena. Possibly more bridges and / or tunnels as there always seems to be a constant stream of proposals for new bridges to the east of London, although so far none seemed to have got past the concept stage. 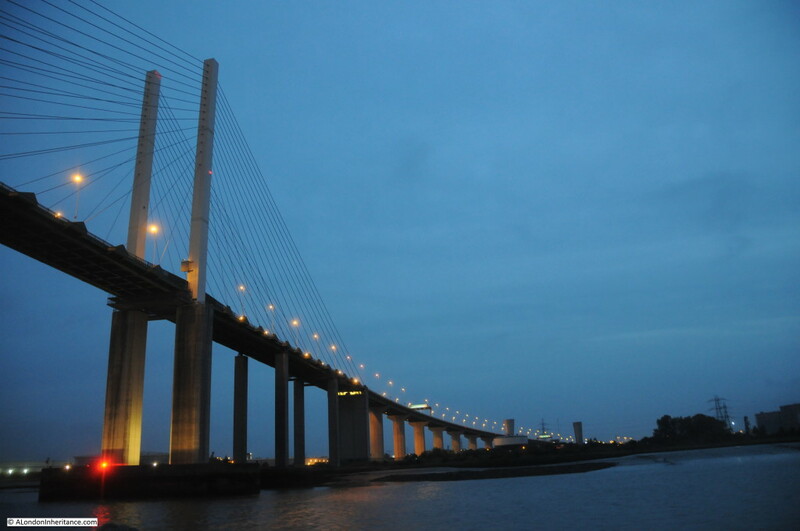 The latest scheme is for a tunnel at Silvertown, the proposals for this tunnel are currently open for consultation. The new docks at the London Gateway may well expand, will this impact Tilbury? Will the Thames Hub / Estuary Airport go ahead despite the majority of expert opinion apparently being against an airport in this location. It would be good to see more traffic on the Thames, there does seem to be a gradual growth in passenger traffic on the river. To take a look at the Thames from City to Sea, the Paddle Steamer Waverley is planning to run trips along the Thames next year. I will certainly be taking another trip. 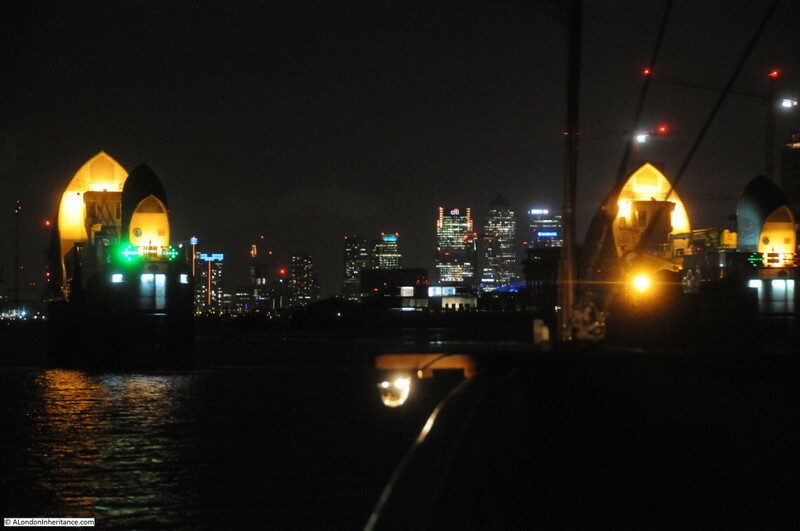 This entry was posted in The Thames and tagged Greenwich, River Thames, Thames at night, Thames Barrier, Tower Bridge on October 30, 2015 by admin. Well, that was a very enjoyable series. I found that most interesting,seeing the banks of the Thames from the water. Good photographs too, especially the nightime ones. I have saved them to re-read at a later date. Thank you! Thanks Jo for the feedback, really appreciated. Thanks David, for another fantastic blog article. (For some reason this one didn’t come through to me via email as usual? – luckily I picked it up via Twitter). This one is particularly impressive with the buildings and structures being lit. 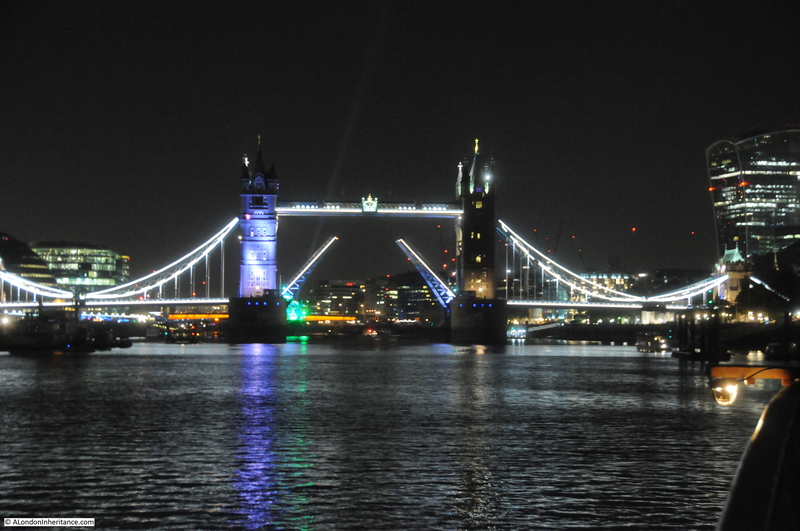 I bet your Dad would be amazed at the changes in London highlighted by the illuminations. Thank you for a wonderful few days travelling back and forth along the Thames stirring up old memories and broadening my knowledge, whilst sitting in the comfort and warmth of my armchair with a cuppa. I look forward to more of your fascinating articles! Thanks Jan for the feedback, really appreciated. Not sure what happened with the email distribution. This is the first post in which I have used video so it could have been that for some reason. 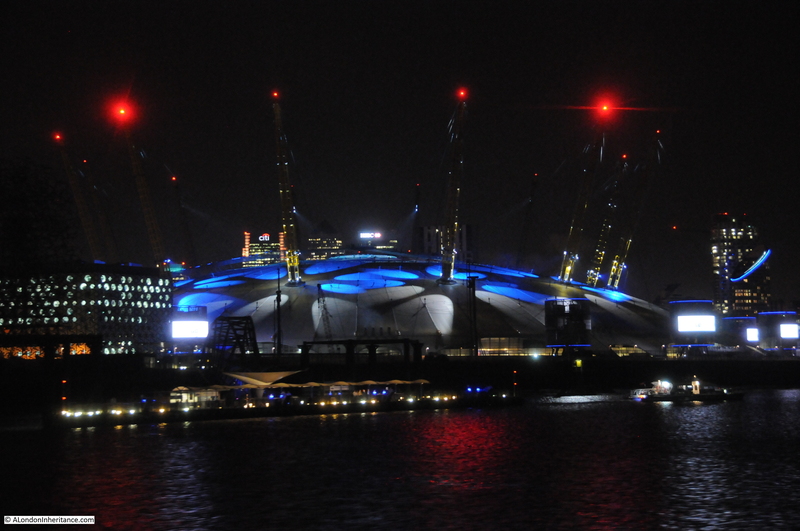 The view from along the Thames does look very impressive at night. It will be interesting to see how the river continues to change in the future. FYI your reply hasn’t come through email either, just glad I’ve got Twitter and I happened to look at your repeat Post. Wonder if anyone else is having any problems, or it’s just me? I would hate to miss anything! Jan, thanks for letting me know. Hope that something is not broken. Will see if e-mail works with next post. This is weird David, your last reply came through OK? Don’t know what you did differently. I think Hallowe’en is playing tricks with us, ha ha! Thank you for a very interesting week of reading about your Thames journey. We saw The Waverley at Southend last year and now plan to do this trip next year. I didn’t receive your last post on your night time return journey until today (1November). Thanks Sara for the feedback. I really recommend taking a trip on the Waverley next year, just hope it is not as misty and grey as my trip.